Put this one on your summer-stew-to-do list. It's loaded with taste and nutritional benefits. 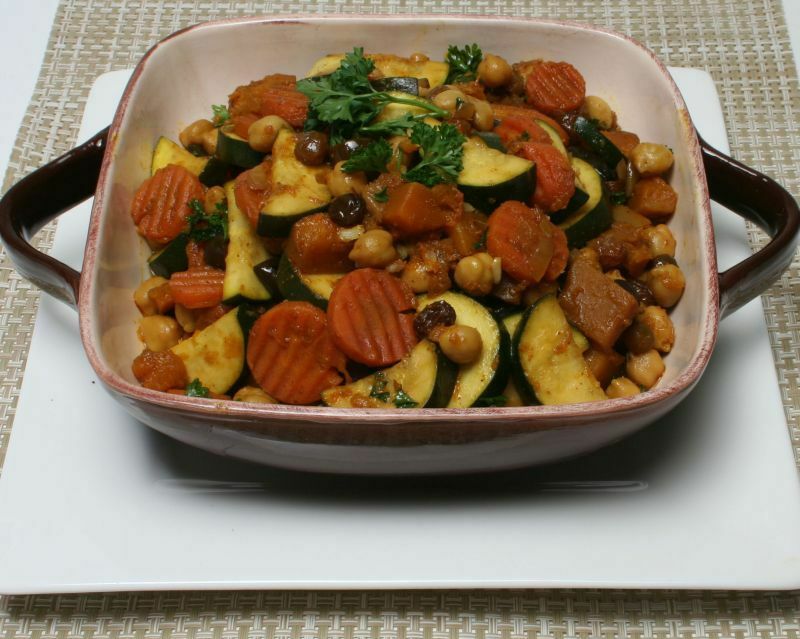 When we received the recipe for this Mediterranean Vegetable Stew we thought, good, another Mediterranean recipe. After all, the Mediterranean diet is touted as being a very effective diet, especially for heart health. This stew recipe is no exception. It is healthy and, most of all, delicious! Starting with the ground clove – its uniquely warm, sweet and aromatic quality complements the chili powder's heat – the mixture of spices create a distinctly Mediterranean flavor. Cloves are dried flower buds from an evergreen with red and while blossoms. It actually takes four to seven thousand buds to make one pound of cloves. The name is derived from the Latin word clavus, which means nail – not surprising given their shape. Though they are often associated with ginger bread and pumpkin pie, cloves also make a wonderful addition to soups and stews. The cardamom, another ancient herb, popular from India to Scandinavia, provides a pungent and aromatic quality. Combine this with sweet raisins, the nutty flavor of the butternut squash and garbanzo beans, and garden vegetable favorites for a rich, satisfying dish that fits the season. It's makes great leftovers too. Serve it with hearty brown rice or whole-wheat couscous for the energy you need without a lot of extra calories and fat. Heat oil in a large pot over medium-high heat. Add onion. Cook until translucent, about 2 minutes. Add broth. Reduce heat to medium-low and simmer, stirring frequently, about 20 minutes. While broth is simmering, combine spices in a mixing bowl then stir them into pot. Add butternut squash, raisins, carrots and garlic. Cover and continue simmering until vegetables are tender, about 25 to 30 minutes. Add in zucchini, garbanzos, olives, salt and pepper. Re-cover and continue to simmer until zucchini is tender, an additional 10 to 12 minutes. Stir in 2 tablespoons parsley and lemon juice. Place warm rice uniformly on large serving platter (or individual plates). Spoon the stew over bed of rice. Garnish with remaining parsley and serve. Makes 6 servings (about 1 cup stew per serving). Per serving: 300 calories, 6g total fat (1g saturated fat), 54g carbohydrate, 11g protein, 9g dietary fiber, 464mg sodium.